Phi Phi the beach refers to two differing things on Koh Phi Phi. The Phi Phi The Beach movie was recorded in 2000 and is all about Maya Bay, the unspoilt beach hidden from the outside world in a backpacking dreamworld of perfection. The Phi Phi The Beach Resort is 3 star accommodation with outrageously good views. Phi Phi the beach might refer to any one of a number of picture perfect Koh Phi Phi beaches like at Tonsai and Loh Dalum Bay or the smaller Nui Bay or Wang Long. Phi Phi beaches are striking and arresting. The golden white sand is surrounded by jungle covered cliff scenery and as you pad towards swimming depth, you realize the water is a fantastic 29 degrees centigrade, a temperature you can swim in all day. The sea turns from an aqua marine blue near the beach to a deep blue as the waters plummets to 15 meters or more. As you gaze around you sense that every direction is worthy of a picture. Welcome to paradise. A-list Leonardo Di Caprio brought fame to Koh Phi Phi Ley when his movie crew arrived to shoot in Maya Bay. Since the movie came out, many have taken trips to get a glimpse of, or even land at, Maya Bay. The Half Day Speedboat Tour to Maya Bay Phi Phi is a great way to see the beach if you staying on Phi Phi Don. 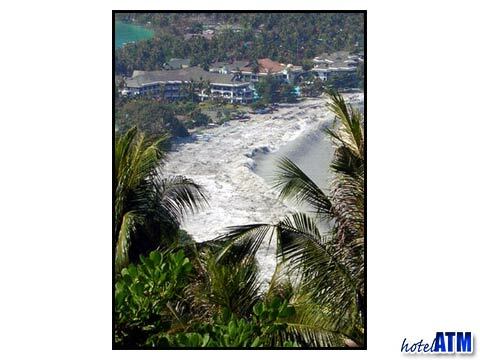 If you are in Phuket the Phuket Phi Phi Tour by fast Speedboat tour arranges the same but over a whole day. Many of those that take the 2 Dives off Phi Phi Ley tour end up with great inter dive 'surface time' at Maya Bay. Phi Phi The Beach Resort lies on the far eastern end of Long Beach, a beach that angles towards Koh Phi Phi Ley, the Tonsai cliffs of Koh Phi Phi Don and the setting sun. The rooms are set back 50 metres from the beach front, built on a gentle slop. The Superior rooms have partial ocean views through the semi mature woodland and the Deluxe rooms have the best views on the island out over the bay. Golf buggies take you to the rooms which is near essesntial for the higher up Grand Deluxe Seaview rooms. Phi Phi The Beach Resort Tripadvisor and phi-phi.com reviews point to a mixed picture. There a some specific grieviences and some of the these point to personel requirements failures while other point to resort flaws. However recently a large proportion of guests review with a 5 out of 5. Here are those Phi Phi The Beach Resort reviews. More Phi Phi The Beach information can be found out from these articles; Leonardo DiCaprio and The Beach On Phi Phi, Best Beaches on Phi Phi Island and Best of Phi Phi Island. These articles run you though more facts about Maya Bay and Leonardo Di Caprio, those great Phi Phi Beaches and all the bests things to see, do experience on the islands.